This funny Shoebox cartoon reminds me of how my Sunday morning wardrobe has changed over the years. Up until the 90s I religiously wore a jacket and tie to church on Sunday morning. Gradually the suit morphed into khakis and more recently I usually wear jeans - this summer I even wore shorts on a few Sunday mornings. What do you think? How casual should we be on Sunday mornings? I like it more casual, too. I do dress my little ones up, though, but my near-teen wears jeans and so does my hubby. I think we should come as we are for the most part. 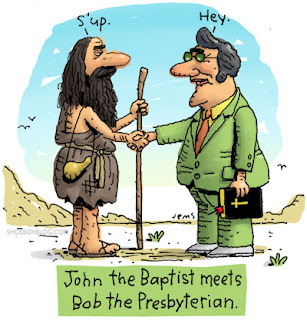 The thought of John the Baptist saying "s'up" cracks me up! "we should come as we are "
I feel church casual makes it much easier for an unbeliever or new Christian to come in and feel at home. We live in a very casual society and expecting people to dress up to go to church can be a barrier. I am in favor of removing non-Biblically based things that would tend to keep people out. I stopped wearing a coat and tie years ago because I did not want to look more formal than the pastor. I do not normally wear jeans, but would have no trouble wearing them to church if I did. Thanks for the thoughtful comment Mike! I agree with your take on society being casual. Hi Bob! I like church casual too, for all of the reasons mentioned above (not to mention its just easier and more comfortable to not get all dressed up). Although, I can still hear my father teaching me that we dress up for church (I had a Catholic upbringing) to show respect. I work for a Presbyterian church and the pastor wears shorts and sandals to work, I'm not sure what he wears on a Sunday morning, but I would guess its khakis and a polo shirt or something. I can relate to wearing shorts when I worked on the church's pastoral staff Barbara! Loved that casual approach to ministry.